Calbee loves peas. Their obsessed with peas. They're actually a legume - a funny sounding French word pronounced, leg-yoom referring to any plant wit seed pods that split into tow halves. 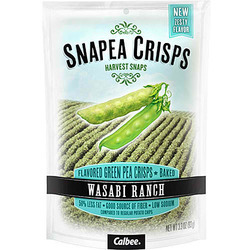 Snapea Crisps fit, but Calbee is split on what makes this one amazing snack. Is it the remarkable, zesty flavors or the nutrient-packed wholesomeness of nature's perfect package? You decide. Either way, when you're handed a bag of delicious Snapea Crisps, Simply Say, Yes, Peas!